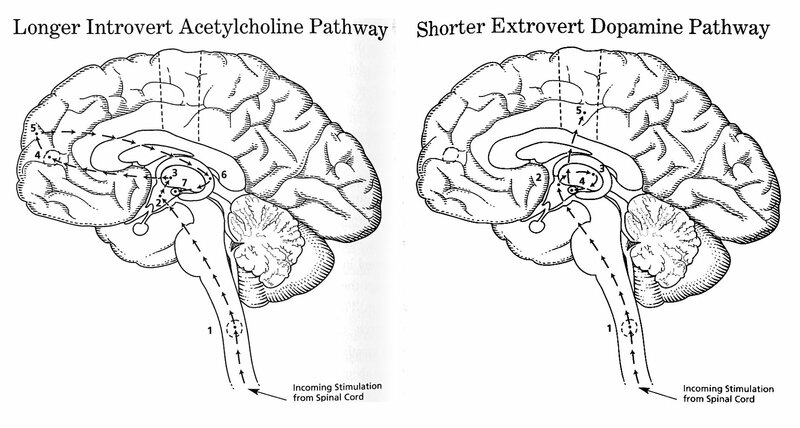 If we go a bit further back, we find that the terms introvert and extrovert (originally spelled extravert) were popularized by Carl Jung in the early 20th century. Unfortunately, their meanings got confused between then and now, and we started thinking that everyone belongs to one camp or the other. But actually, Carl’s point was that these are the very extremes of a scale. Which means that most of us fall somewhere in the middle. In the 60s, psychologist Hans Eysenck proposed that the difference between introverts and extroverts was that they simply had different levels of arousal—meaning the extent to which our minds and bodies are alert and responsive to stimulation. Hans’s theory was that extroverts have a lower basic rate of arousal. This means that extroverts need to work harder to arouse their minds and bodies to the same ‘normal’ state that introverts might reach quite easily. This leads extroverts (or extroverted people, though they might not be quite on the extreme end of the scale) to seek novelty and adventure, and to crave the company of others. For introverts, this kind of stimulation can be overwhelming, since their rate of arousal is much higher, so they are stimulated easily. Time alone, one-on-one conversations and predictable situations are more likely to be pleasant for introverts who are more sensitive to external stimulation. This becomes especially interesting if we look at other of the most common elements of body language and how introverts and extroverts might perceive behaviors differently. On the same note, whilst exercising makes you happier in general, for an introvert to do a group sport, this might not lead to happiness in the same way it does for an extrovert. What are signs that point someone closer to an introvert? Introverts are tricky to understand, since it’s so easy for us to assume that introversion is the same as being shy, when in fact introverts are simply people who find it tiring to be around other people. On the opposite side of the coin, people who are extroverted are energized by people. They usually enjoy spending time with others, as this is how they recharge from time spent alone focusing or working hard. Ambiverts – the in-between that most of us are probably closer to? Since introverts and extroverts are the extremes of the scale, the rest of us fall somewhere in the middle. Many of us lean one way or the other, but there are some who are quite balanced between the two tendencies. These people are called ambiverts. So let’s look at how an ambivert compares. Though ambiverts seem to be the more boring personality type, being in the middle of everyone else, this balance can actually be a good thing. A study by Adam Grant, author of *Give and Take: A Revolutionary Approach to Success found that ambiverts perform better in sales than either introverts or extroverts. Ambiverts actually closed 24% more sales. The commonly held myth that being highly extroverted is important for a salesperson is actually untrue, since extreme extroverts lack the balance of an ambivert which helps them to use varied approaches to closing a sale. On another note, we’ve explored before that simple productivity tips might not work in the same way they do for introverts vs extroverts, knowing where you are on the scale can make a big difference to improve your daily productivity outcome. It’s pretty much certain that we’re going to come in contact with a variety of personalities throughout our lives, from extreme introverts to extreme extroverts, and everyone in-between. Understanding the differences between these tendencies can help us to get along with others and get the best out of everyone. The first few months of living together didn’t work well because we didn’t know how to care for each other! I would try to give her space by always knocking on her door. She got annoyed because I kept knocking, and wouldn’t let myself in, and I got annoyed when she barged in my room without warning! If we focus on simply being extremely aware of which type we’re dealing with, noticing small behaviors that point us more in the extroverts or introverts direction, then I’ve we’ll be easily on the right track to dealing with people in the right way. Especially in our Social Media age, if we look at some of the latest social media statistics, there is a clear trend that caring for introverts and extroverts is something we should keep focusing on. What has your experience been in dealing with both extroverts and introverts? I’d love your thoughts on this! You can leave a comment below, email me or catch me on Twitter at @bellebethcooper.